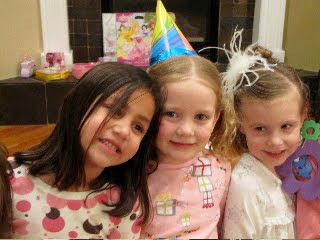 This is picture from a birthday party Bella went to last week. I usually don't post pictures of her at parties, but this party was different. The b-day girl in the middle is Jaci and the other little girl is Ivy. These girls belong to two very good friends of mine. Friends I've had since jr. high! As I was watching these girls play, before we left, I started talking to my friends mom (Cindo) and we both kept saying how crazy it is that Lindsay and I have kids. When did we get old enough to have kids who play together? The girls had so much fun and I love that they all play together! What's even more incredible is when our good friends have kids that are now having kids! Yikes!